Which Trades Can Our Google Ads Specialists Help? Compliance requirements increase significantly compared to other trades. Carpentry is sometimes regarded as a calling rather than just a job. Carpet cleaning has also evolved to include sofa, tile, mattress, and rug cleaning. Cleaning homes and offices will not be replaced by artificial intelligence. Occupational Health & Safety compliance plays a crucial role in Australia. Gardening Services feed into the Australian Home and Garden passion. You need great attention to detail, experience and a very specific system. Pest Control consumer demand is both seasonal and geographical. Plumbers provide the ultimate Tradie emergency service. Removalists are almost always under time pressure. We utilise Phil from Tradie Clicks for all of our Ad-Words PPC campaigns. Phil brings many years experience from a service operational perspective to the digital marketing arena. He has an extensive knowledge of attracting the right demographic to our website and in return our sales have grown significantly. He is always available to help with digital marketing strategy and his speed of implementation is exceptional. I can highly recommend his services. I have used many different companies to manage my AdWords/SEO campaigns. Most of them promise the world and under deliver. They say that certain things work and that you have to spend $1,000’s to get the best results. From the moment that I met Phil, he was honest, upfront and full of ideas on what would work best. He has been in business himself and understands the financial pressures of running a business. I would not trust anyone else with my campaigns. Phil is awesome! Goodbye to Yellow Pages, leaflets, newspapers. Online Desktop and Mobile Advertising are now dominating. 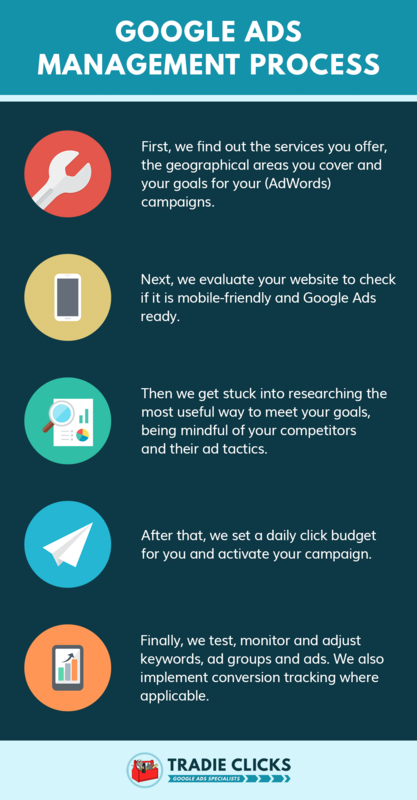 Our Google Ads Specialists Build Custom Made Campaigns Just For Your Company! Google Ads occupy the most prominent space on page one. Google Ads show exactly at the time when a customer is searching for a service or product. You can geo-target a specific area, focus on income groups, gender and age categories. You can schedule Google Ads for a specific season, time or day to show your ads. Through effective keyword targeting you can ensure that searches are extremely accurate. Google Ads are very flexible. You can increase and decrease spending, increase and decrease bidding, pause or activate campaigns. You pay for Google Ads after the advertising takes place. Not sure what type of budget you will need to get more customers with Google Ads? Sometimes you just want a quick phone chat to get your questions answered. Read up to date articles about how to make the most of your Google Ads campaign.